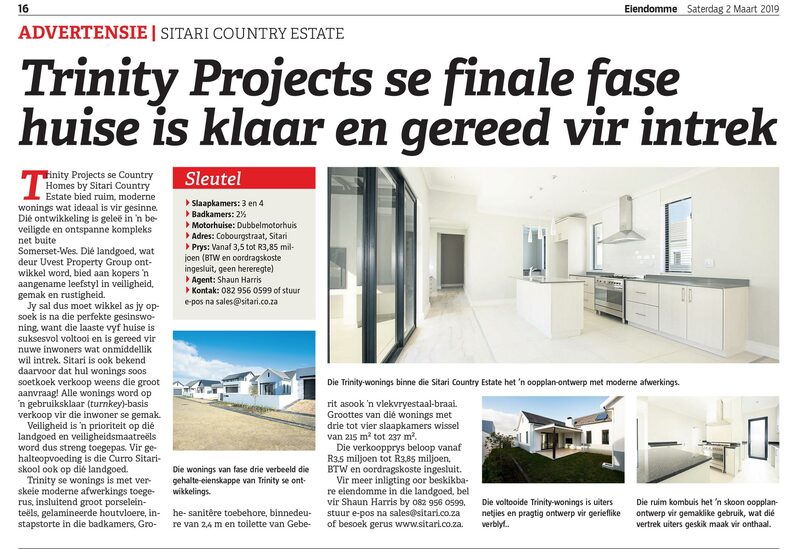 Die Burger Eiendomme: Sitari Country Estate – Trinity Projects se finale fase huise is klaar en gereed vir intrek. 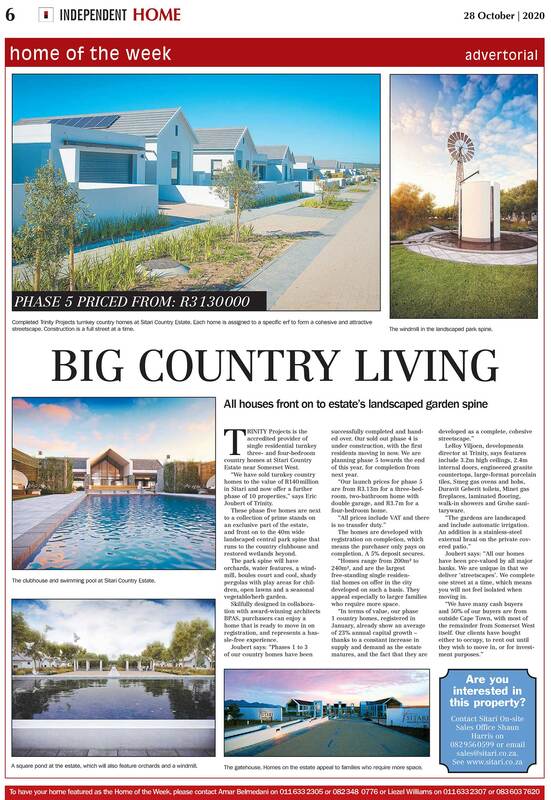 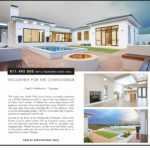 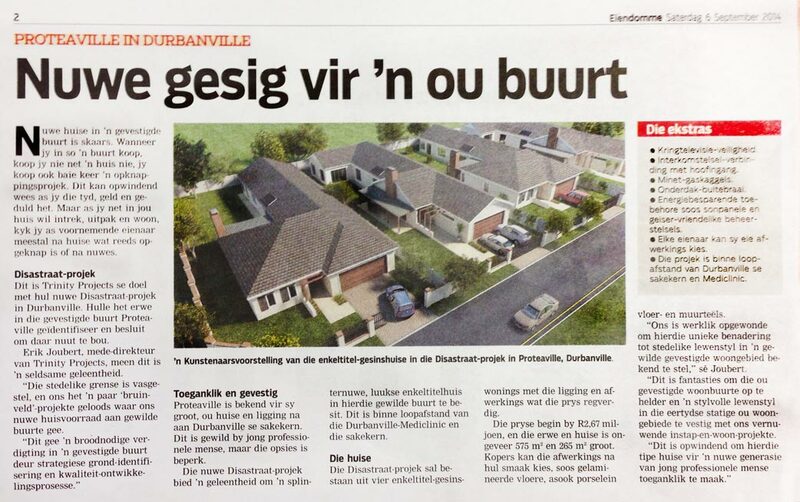 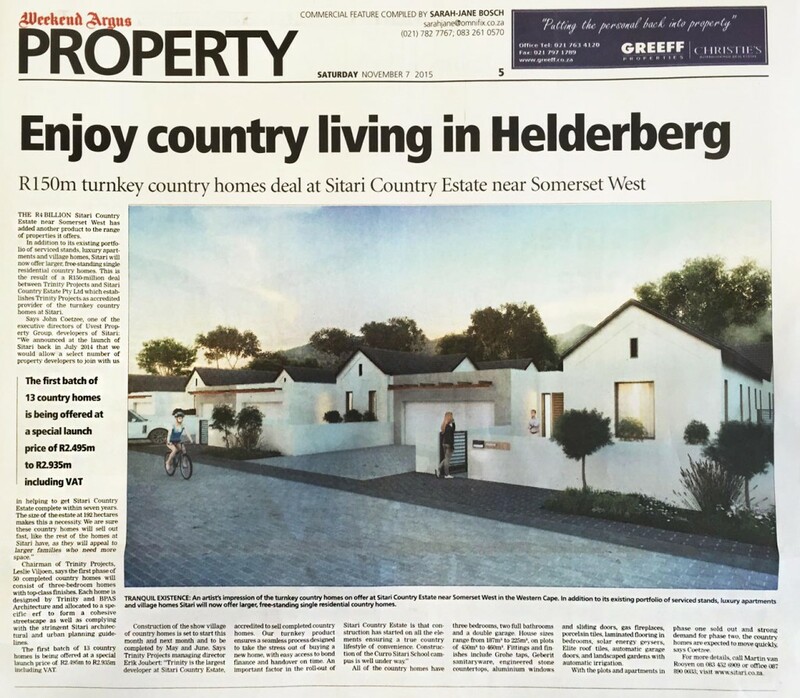 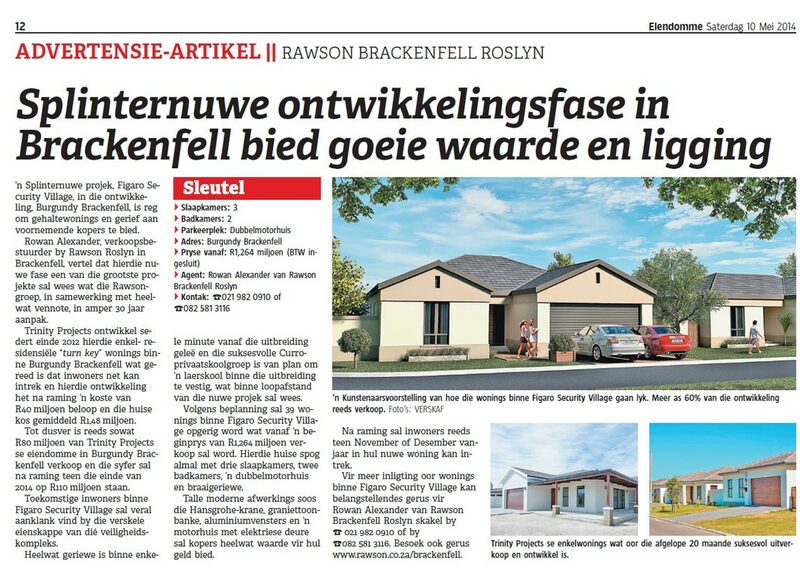 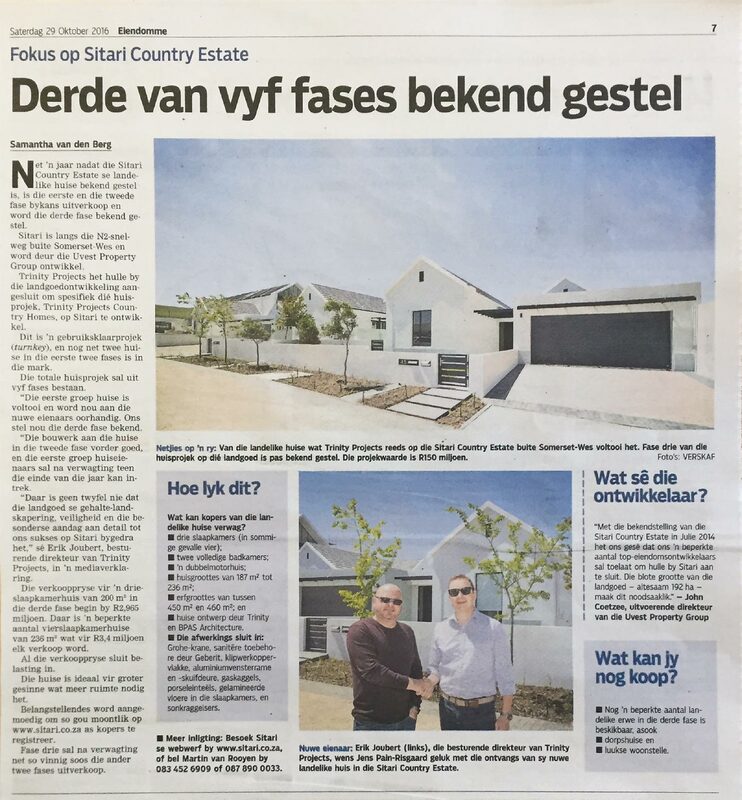 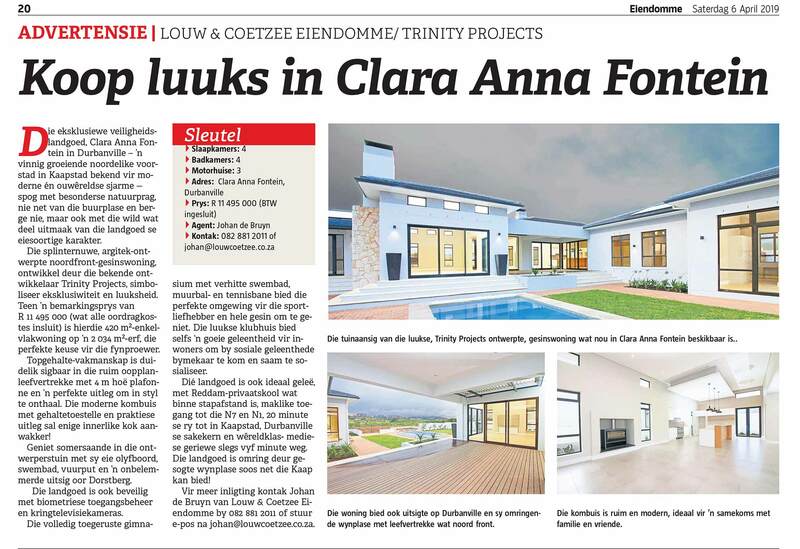 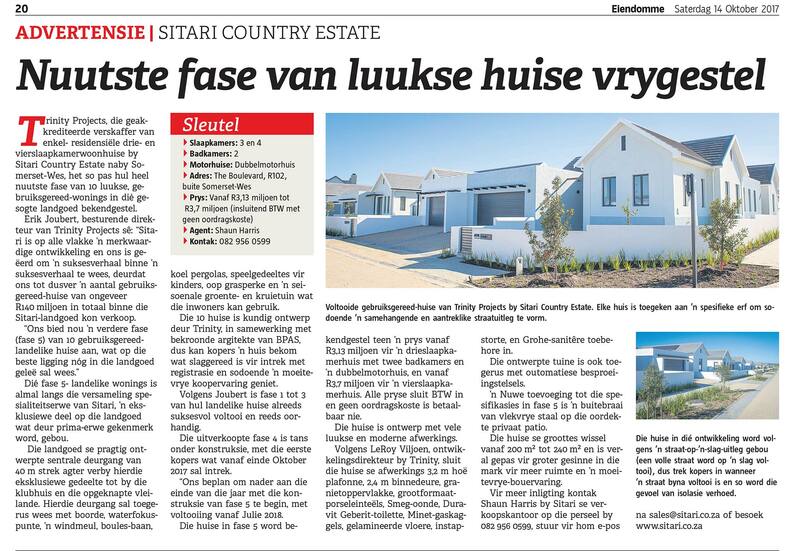 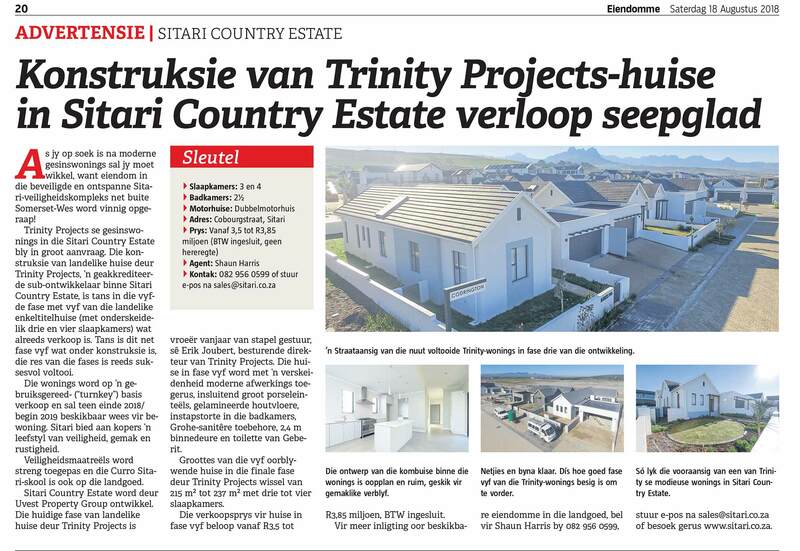 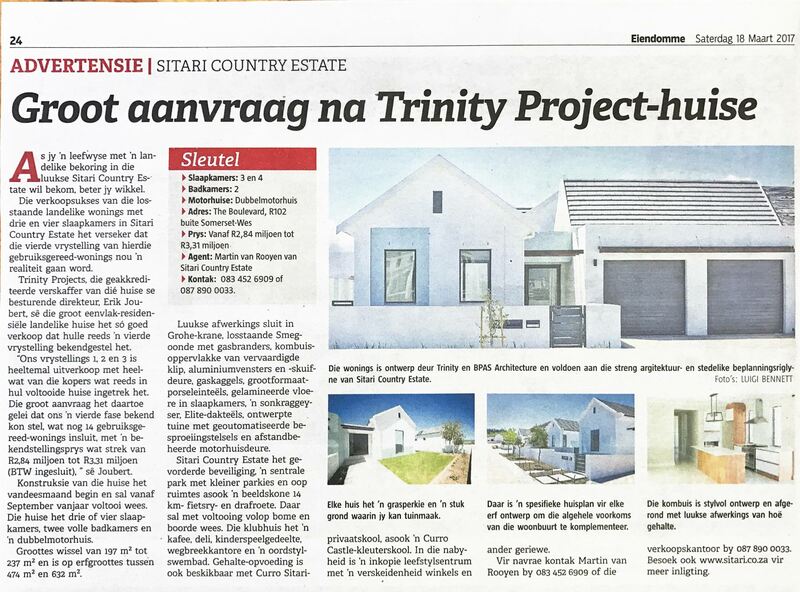 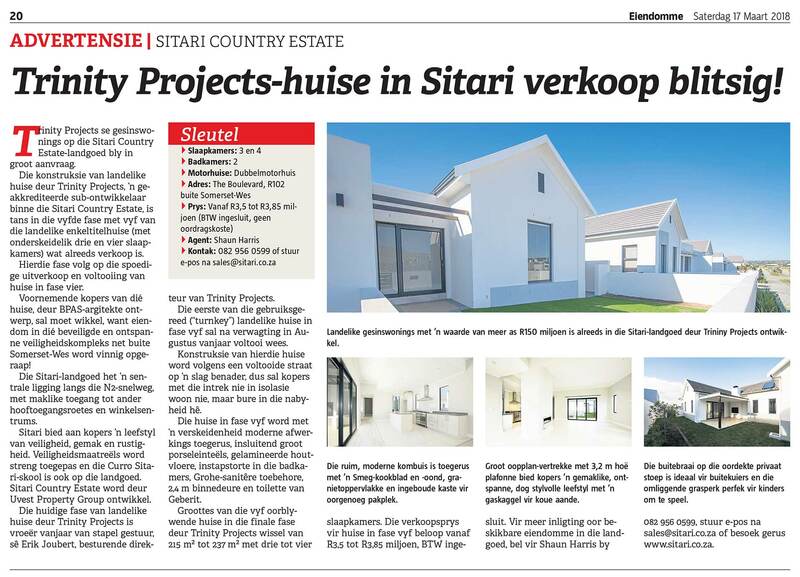 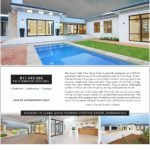 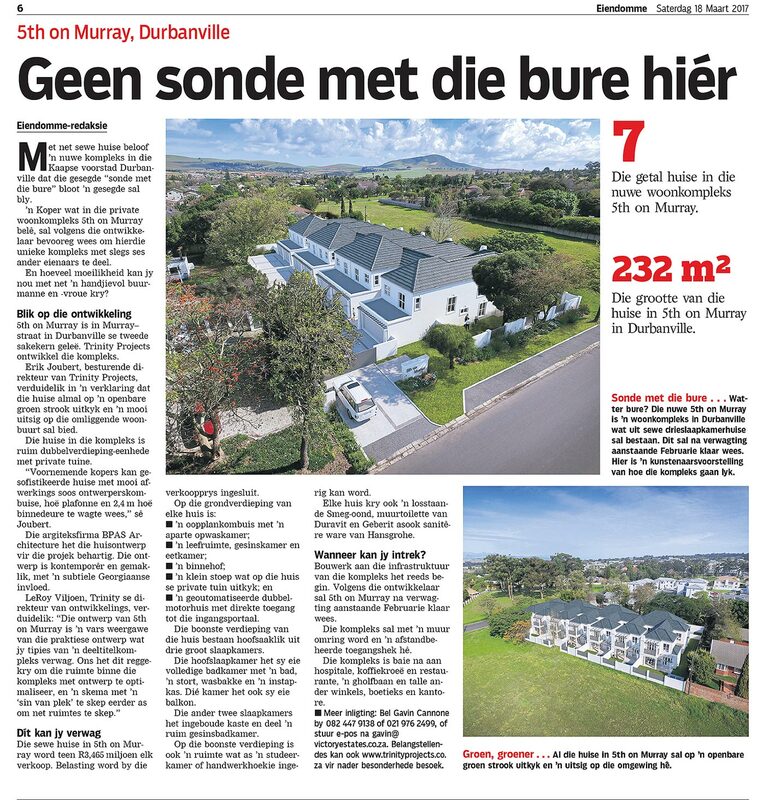 Die Burger Eiendomme: Sitari Country Estate – Trinity Projects-huise in Sitari verkoop blitsig! 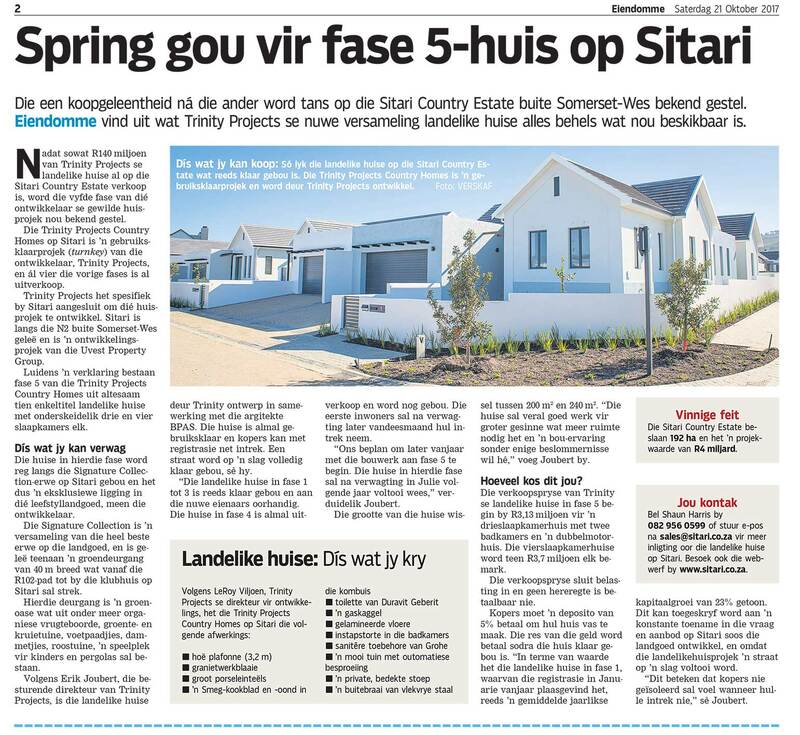 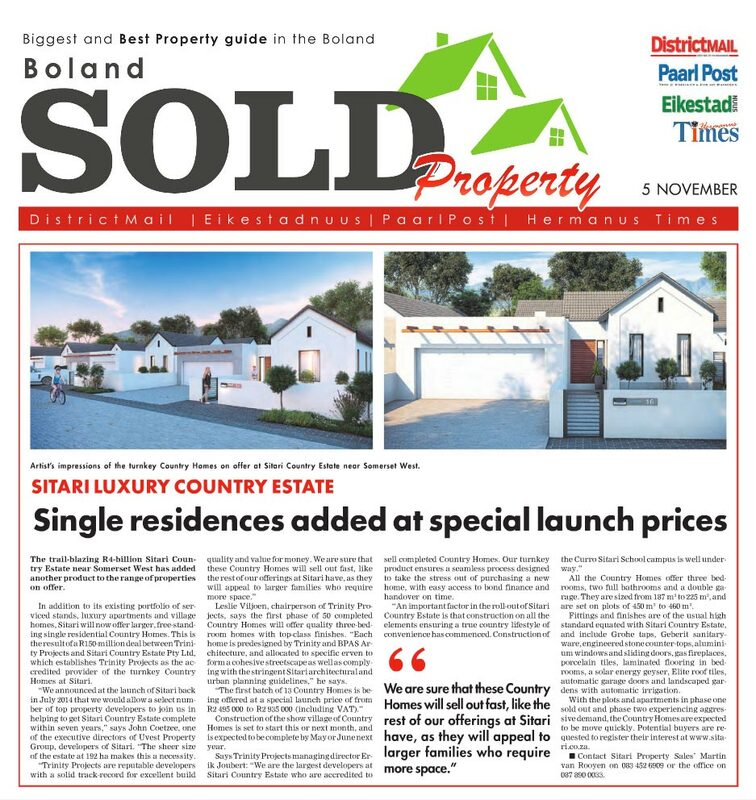 Propertywheel website – Sitari Country Estate’s sales success spurs release of the fourth set of homes. 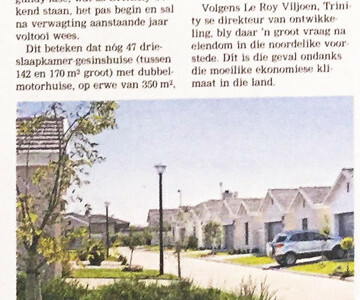 Dis bekostigbaar met die vooruitsig van stewige kapitaalgroei. 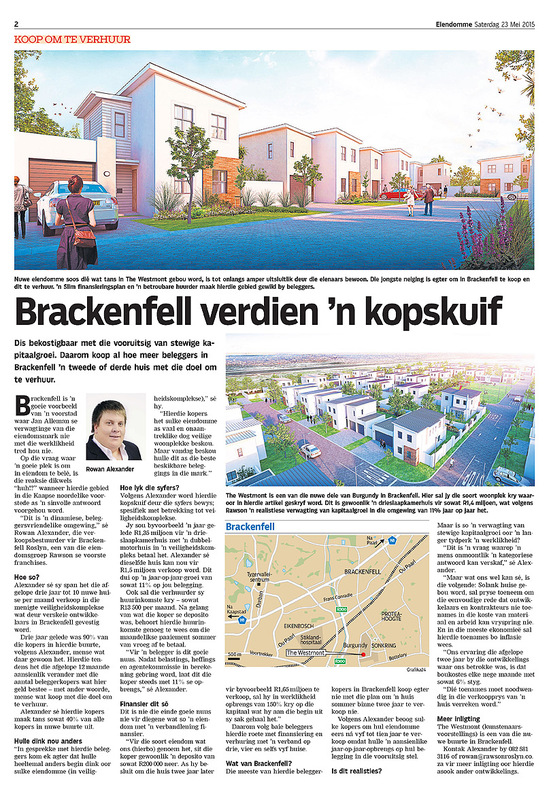 Daarom koop al hoe meer beleggers in Brackenfell ’n tweede of derde huis met die doel om te verhuur. 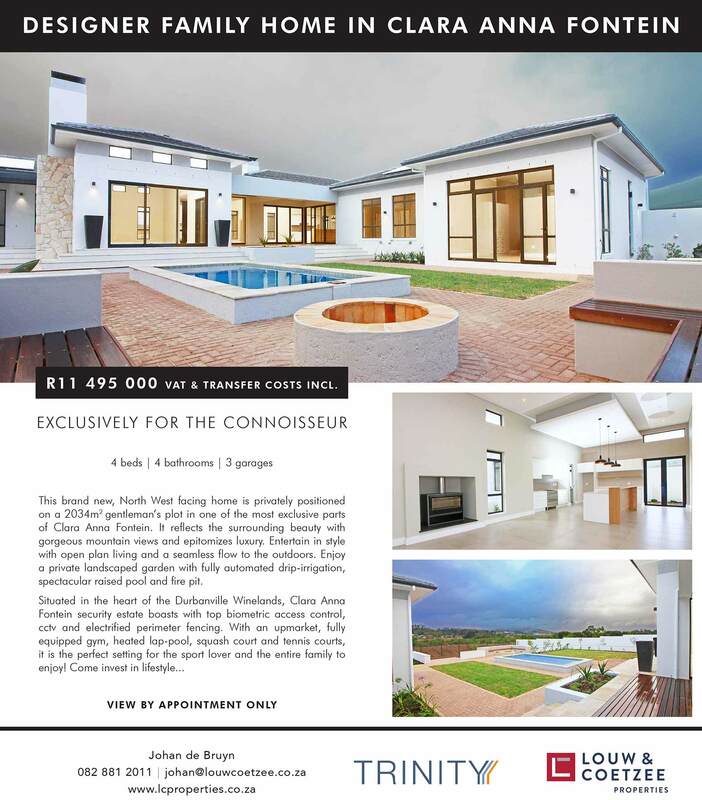 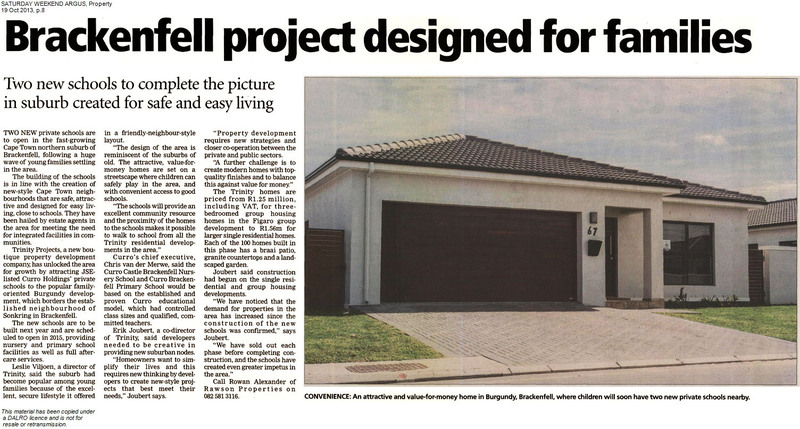 Completed homes at Burgundy, near Brackenfell. 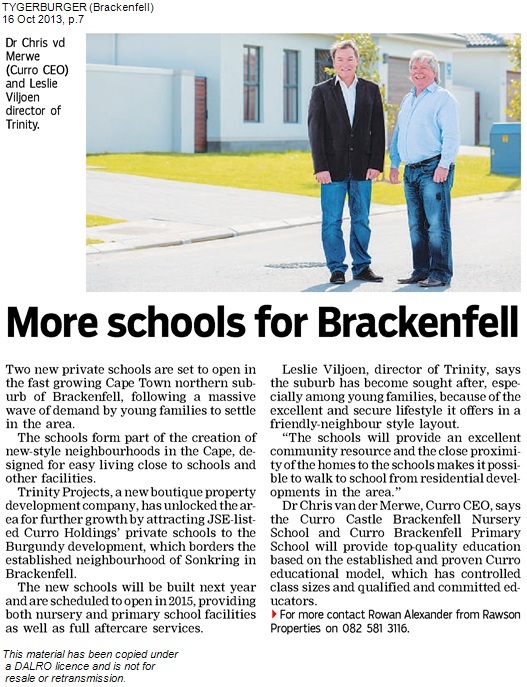 Two new private schools are set to open in the fast growing Cape Town northern suburb of Brackenfell, following a massive wave of young families settling in the area. 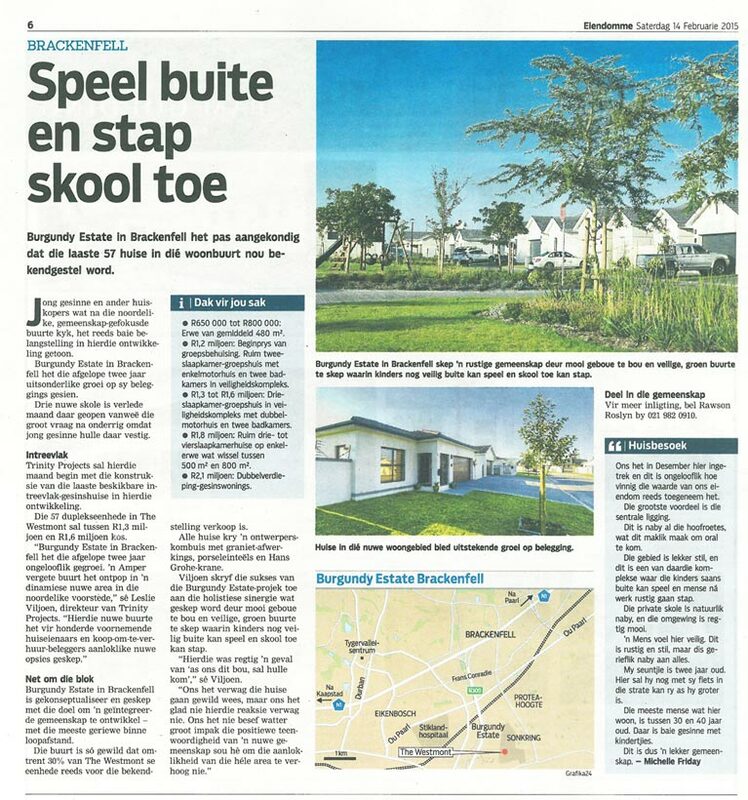 The schools form part of the creation of new-style neighbourhoods in the Cape, which are safe and attractive and designed for easy living close to schools and have been hailed by estate agents in the area for meeting the need for integrated facilities in communities. 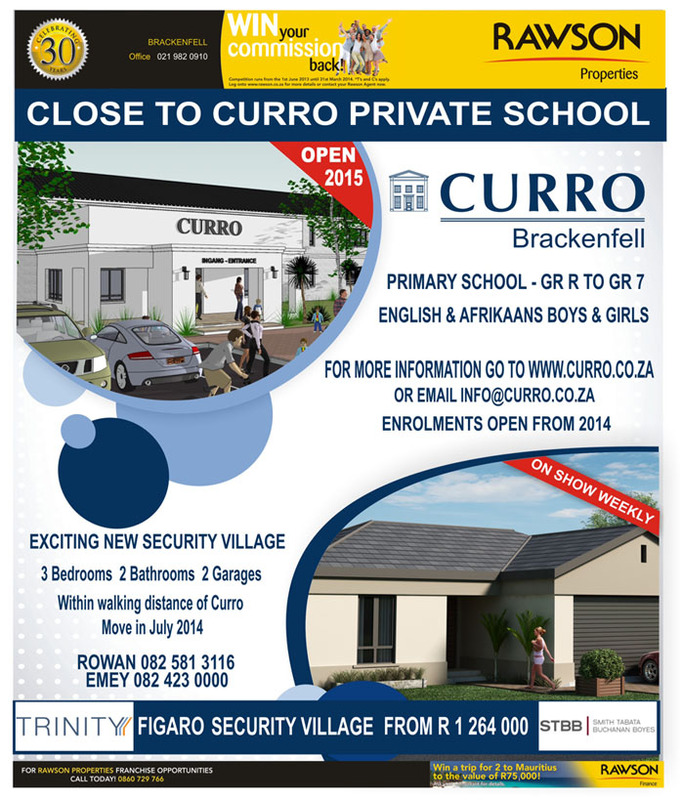 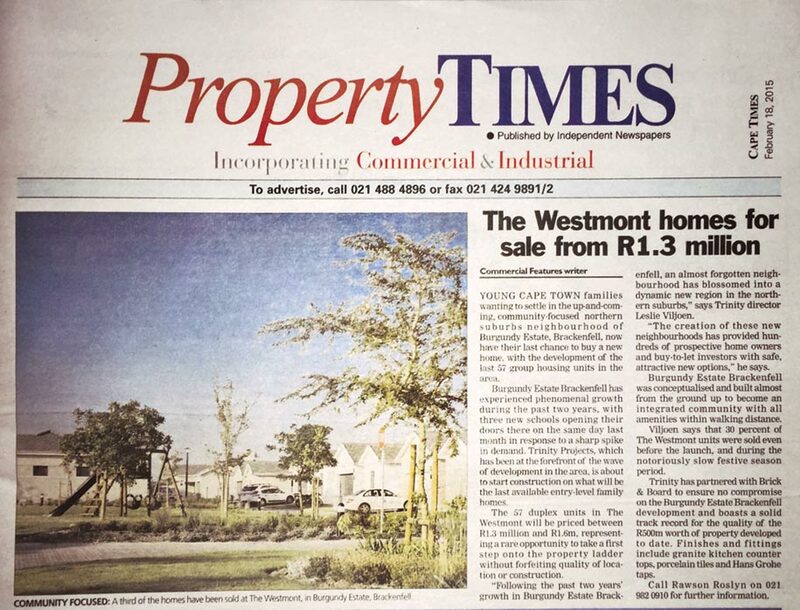 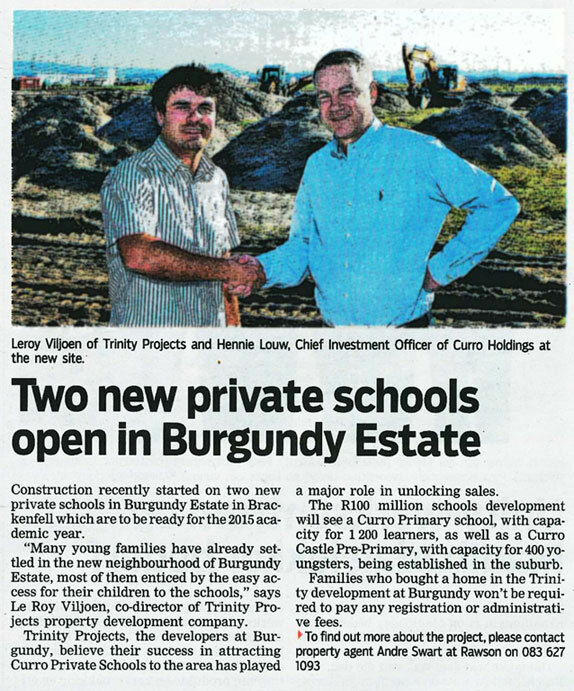 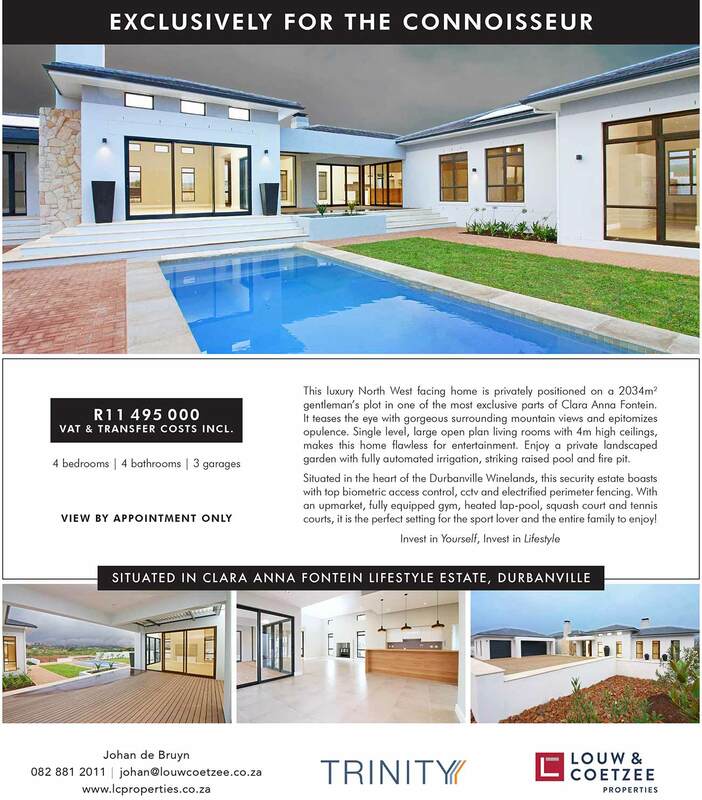 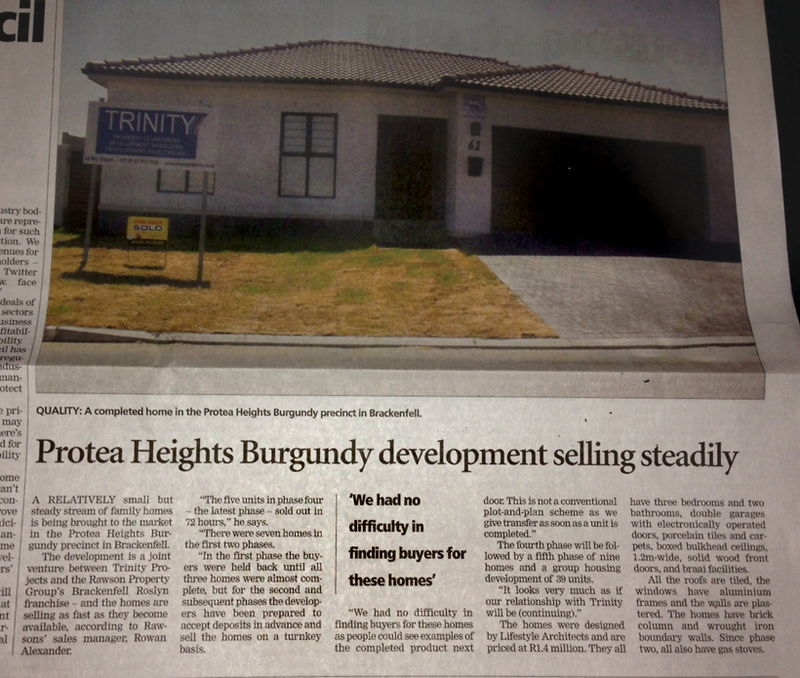 Trinity Projects, a new boutique property development company, has unlocked the area for further growth by attracting JSE-listed Curro Holdings’ private schools to the popular family orientated Burgundy development, which borders the established neighbourhood of Sonkring in Brackenfell. 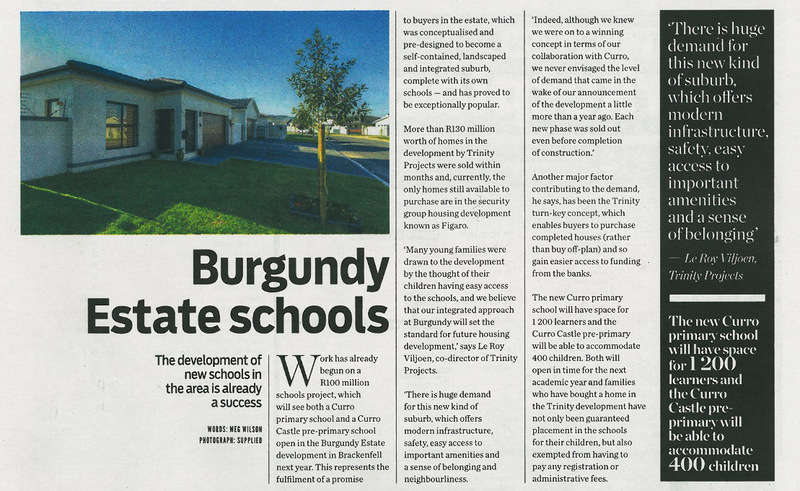 The new schools will be built next year and are scheduled to open in 2015, providing nursery and primary school facilities as well as full aftercare services. 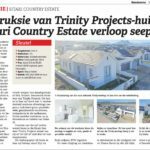 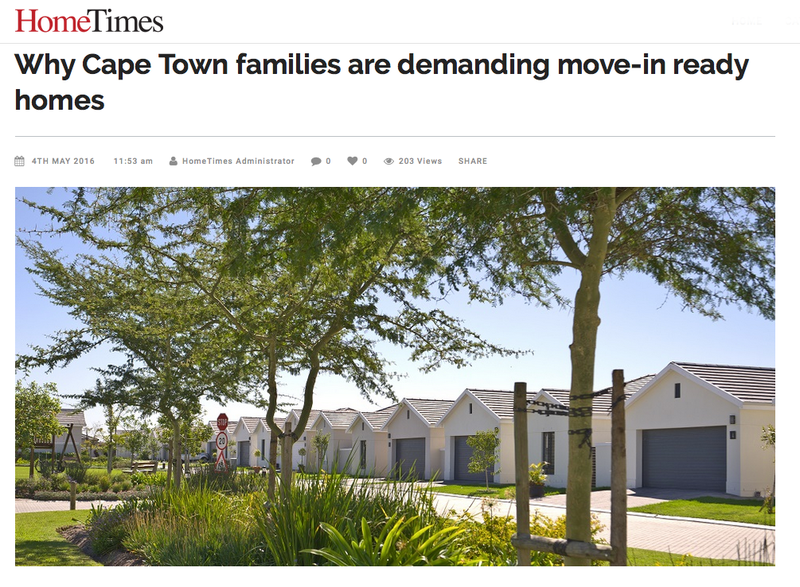 Leslie Viljoen, a director of Trinity, says the suburb has become popular among young families because of the excellent and secure lifestyle it offers in a friendly-neighbour style layout. 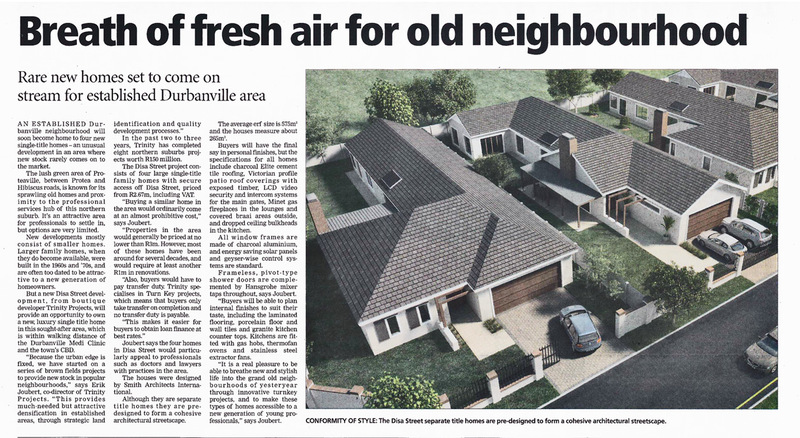 “The design of the area is reminiscent of the suburbs of old. 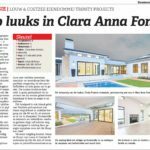 The attractive, value-for-money homes are set on a streetscape where children can safely play in the area, and with convenient access to good schools. 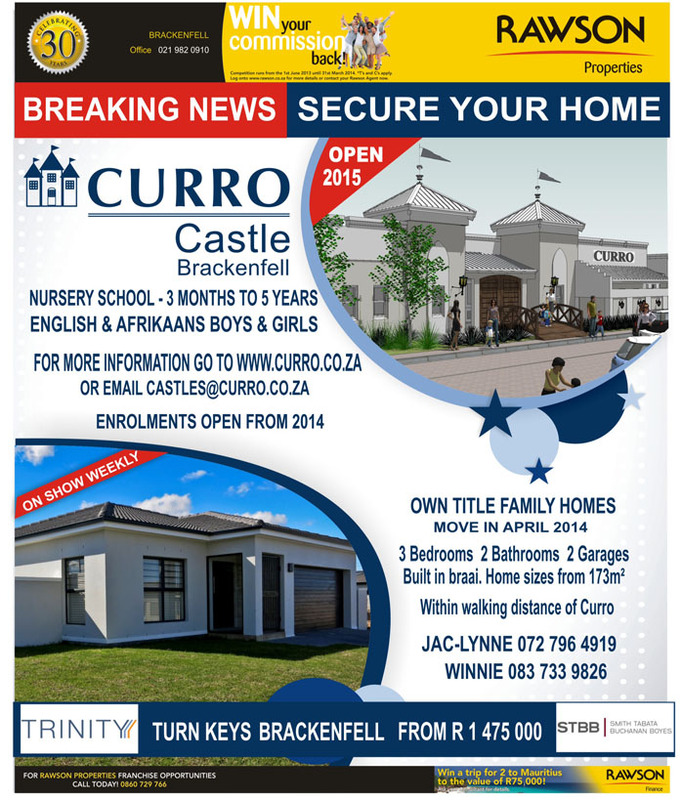 Dr Chris van der Merwe, Curro chief executive, says the Curro Castle Brackenfell Nursery School and Curro Brackenfell Primary School will be based on the established and proven Curro educational model, which has controlled class sizes and qualified and committed teachers. 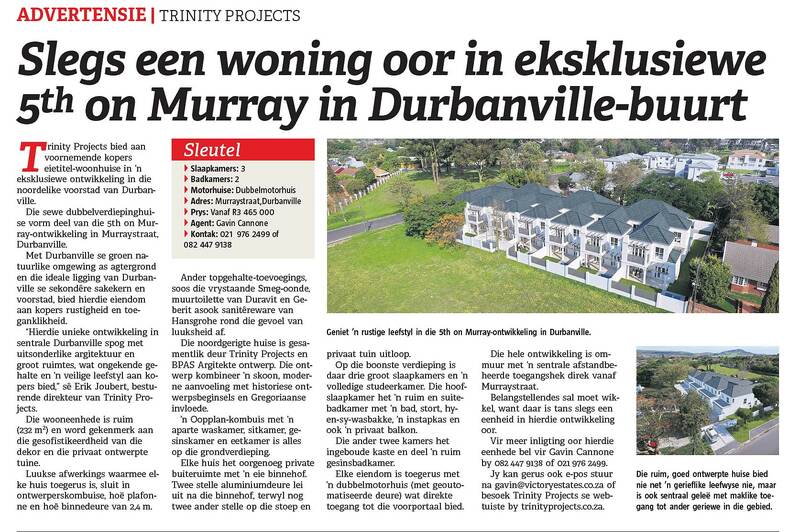 Erik Joubert, a co-director of Trinity, says developers need to be very creative when it comes to providing new suburban nodes. 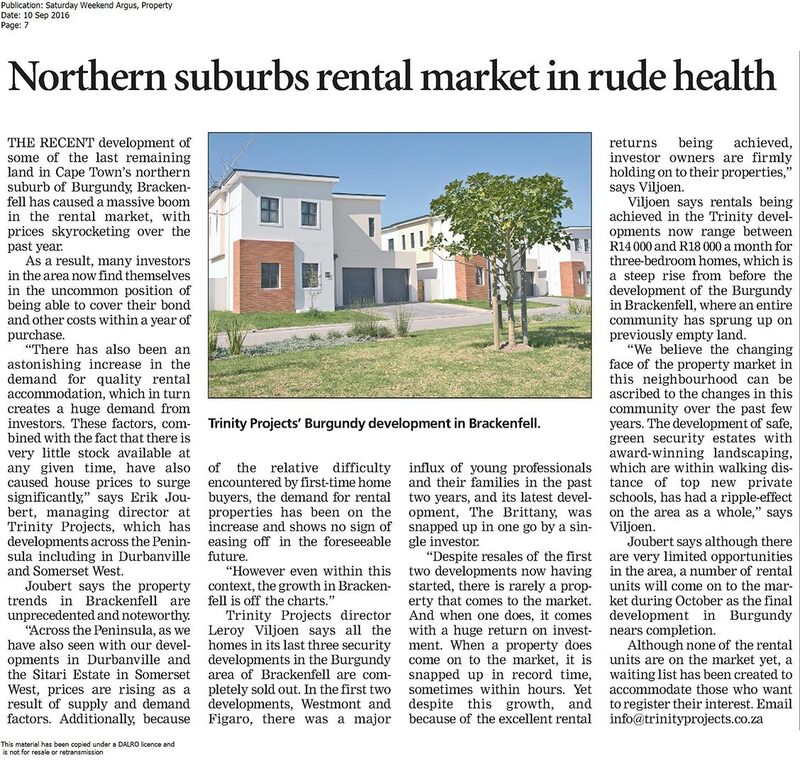 “Home owners want to simplify their lives and this requires new thinking by developers to create new-style projects which best meet their needs. 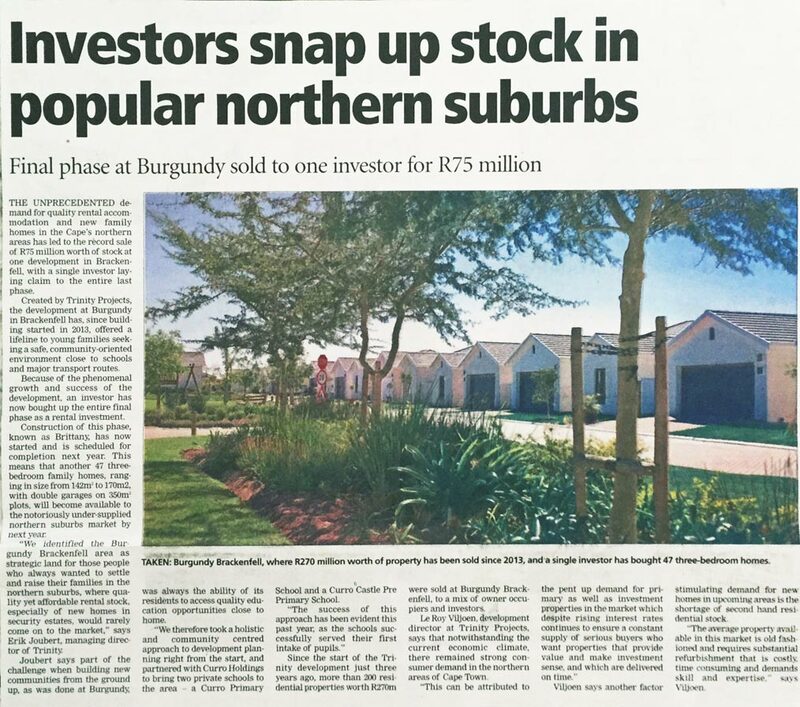 Property development requires new strategies and closer co-operation between the private and public sectors. 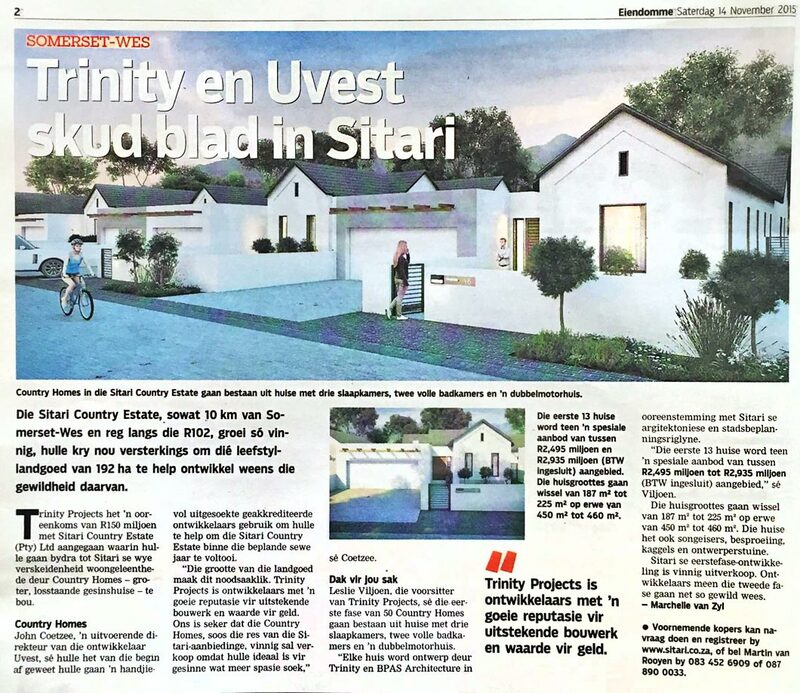 The Trinity homes are priced from R1.25 million including VAT for three-bedroomed group housing homes in the Figaro group development to R1.56m for larger single residential homes. 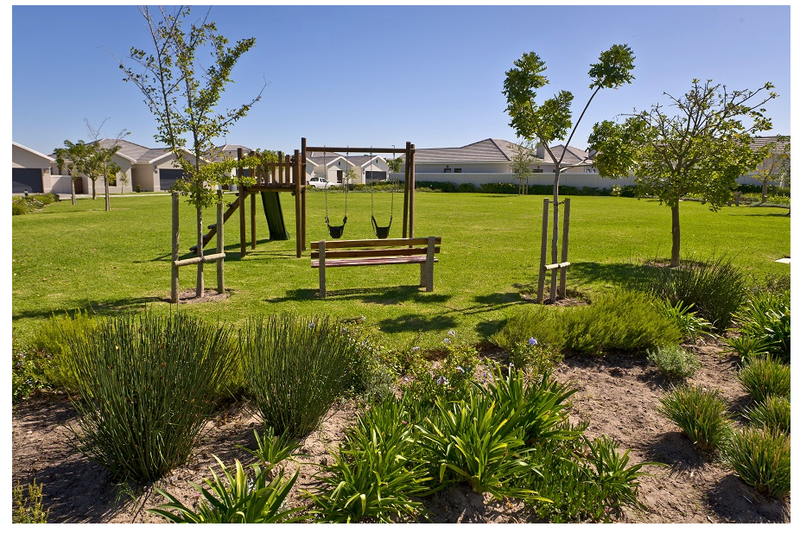 Each of the 100 homes built in this phase has a braai patio, granite counter tops and a landscaped garden. 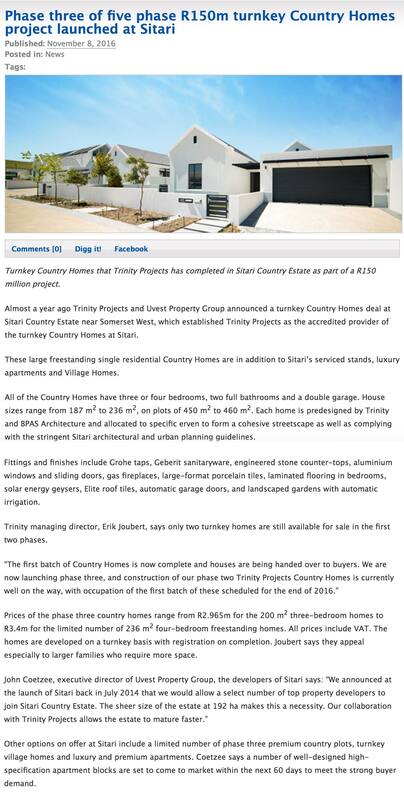 Joubert says construction has already started on the single residential and group housing developments. 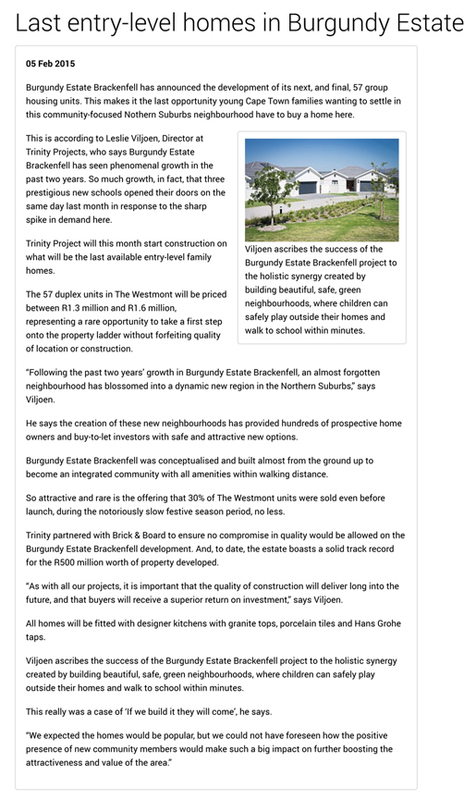 “We have noticed that the demand for properties in the area has increased since the construction of the new schools was confirmed. 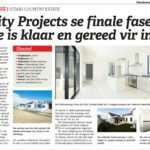 We have already sold out each phase before completing construction, and the schools have created even greater impetus in the area,” says Joubert. 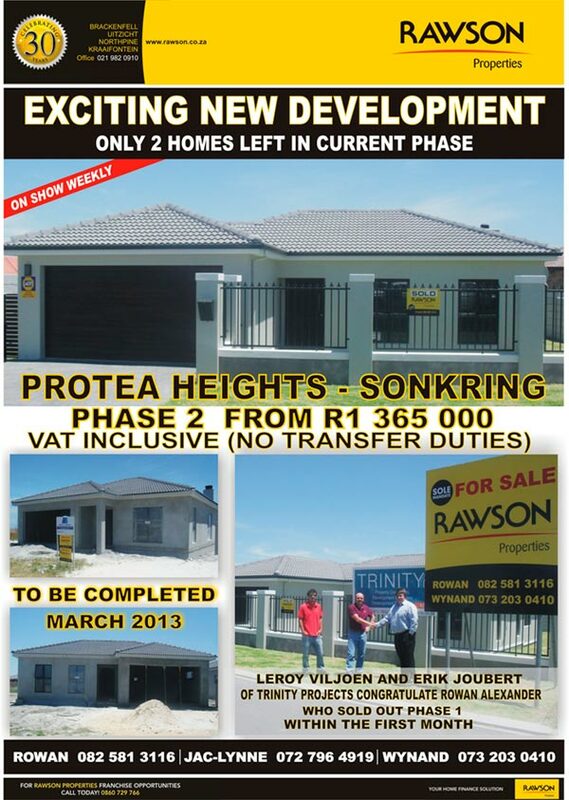 Call Rowan Alexander of Rawson Properties on 082 581 3116.